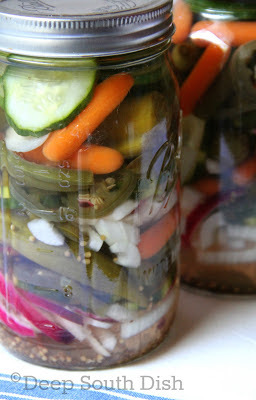 I decided to make up a batch of pickled veggies over the Memorial Day weekend. Pickled vegetables, or Giardiniera (meaning "the garden") is probably familiar to you from the grocery store shelf, but it's a super easy pickled condiment to make at home too. So, what does one do with pickled vegetables? Well, I'm a pickle snacker so of course, they are great as a snack, but they're also used in recipes, they're nice as a pizza topper, chopped up and used in sandwich fillings such as chicken and tuna, served on the side or piled onto sandwiches, burgers and dogs, and Giardiniera can be made with a variety of vegetables, according to what you like. Use fresh, crisp raw vegetables - green or yellow wax beans, baby carrots, cauliflower florets, whole small okra pods, red, yellow or orange sliced sweet bell pepper, cubed eggplant, sliced squash or zucchini, 1-inch celery rib sections, whole button mushrooms, mild hot peppers and pearl onions are all typical and good choices. For a more tangy brine, use less sugar than called for here. Blanch any fresh, hard raw vegetables (such as cauliflower, carrots, fresh beans, okra and celery) by placing them into a large pot of generously salted, boiling water. Return to a boil and let blanch for about 2 minutes. Drain in a colander and submerge colander immediately into a large bowl of ice water to stop the cooking process. Drain and set aside. Mix together the onions; pack by layers divided evenly into sterilized jars, beginning with the sliced onion mix, garlic slices, cucumber, jalapenos, and layers of blanched vegetables. Repeat layers. Place ingredients for brining solution in a medium saucepan and bring to a boil, boiling until sugar is dissolved. Divide evenly between the two jars. Allow jars to sit at room temperature until cooled, tighten lids securely, then refrigerate for 2 full days before using, turning occasionally. Serve chilled. Will keep for several months. Cook's Notes: Consult a professional canning resource for details on water bath canning for mixed vegetable pickles, as this is not a recipe written for canning. You should, however, sterilize jars just as you would as if you were preparing these for canning. I used 2 quart sized Mason jars. Depending on the containers you use, you may not use all of the vinegar mixture. For more tang, reduce the sugar to 2 cups. Suggested Vegetables: Use fresh, crisp, raw vegetables, such as green or yellow wax beans, baby carrots, cauliflower florets, whole small okra pods, red, yellow or orange sliced sweet bell pepper, cubed eggplant, sliced squash or zucchini, 1-inch celery rib sections, whole button mushrooms, mild hot peppers, pearl onions. Cut vegetables so that all are about the same size. 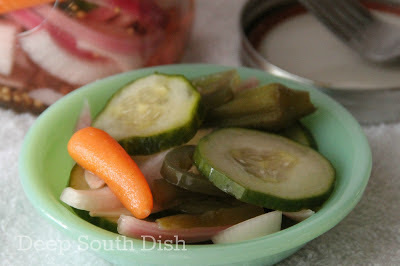 Add in some already pickled veggies for variety, such as whole peperoncini, black and green olives, jalapenos or okra. Cucumber Pepper Variation: Use 7 to 8 cups of unpeeled cucumbers, sliced 1/4 inch thick, mixed with only sliced onions and sweet bell peppers (red, yellow, orange and/or green) or mild hot peppers. This looks wonderful. Always think canning, pickling, jarring as something difficult to do, this is pretty simple. Saving this in my Zip Recipe File. I'm collecting Mason jars now (like I need to collect more stuff, LOL) so I have to use them. I can't wait for my CSA to start so I can pickle!! Beautiful! And it sounds so delicious. I've pickled all kinds of things but have never thought of making Giardiniera. I'm about to change that. Thank you. We just started pickling this year and I am surprised out how easy it is. You giardiniera looks great, just the ticket for sitting on a picnic table during a cookout. Thank you for the recipe. I was delighted to find it here. My husband loves Girardiniera, and with all the fresh veggies available now, it will be the perfect time to make it. Thank you for the recipe. My husband loves Giardiniera. With all the fresh veggies available now, it will be a perfect time to make it.